The death of a man in police custody has been referred to the Independent Police Complaints Commission (IPCC). The 29-year-old, who was arrested in Maidstone on 13 October, had a medical incident while in custody at Tonbridge Police Station, Kent Police said. The force said his death had been referred to the IPCC as a matter of procedure. The police watchdog said an independent investigation had been launched and the man's family had been informed. An IPCC spokesman said the man had been arrested following allegations of a domestic incident on 1 October. 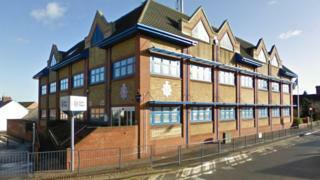 "While in custody at Tonbridge Police Station the man collapsed," he said. IPCC investigators went to the scene where police officers provided accounts and a CCTV trawl was made of the area, he added. The spokesman said investigators were assessing CCTV recovered from the police station. "The man's next of kin have been informed and the IPCC will provide them with updates on the investigation throughout." At this stage all officers were being treated as witnesses, he said.